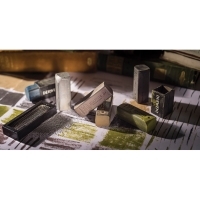 The chunky shape of these extra-large graphite blocks makes them captivating, intuitive, and great fun to use. Available in a variety of rich, dense colors, Derwent XL Graphite Blocks can be used for everything from sensitive line work and subtle blending to expressive marks and deep tonal work. Create different marks with the sides, edges, and corners — or use an embossing tool to create lines and add texture. You can even add water to the mix for splashes and washes. 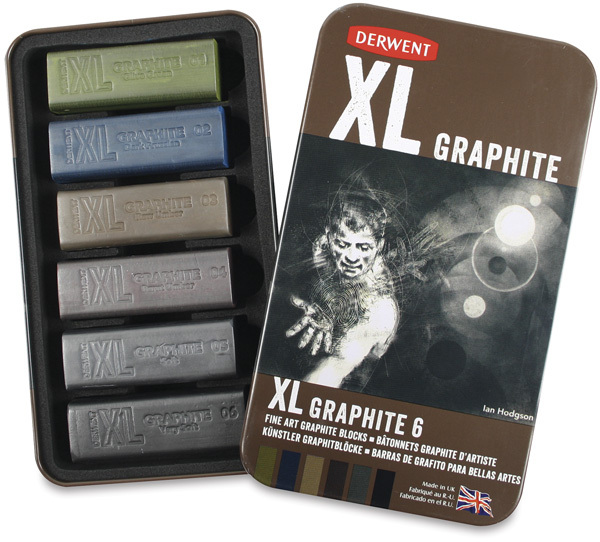 XL Graphite Blocks have a distinctive, soft feel and a silvery sheen. They're also very tactile, so you can use your finger to smudge and move the color around. 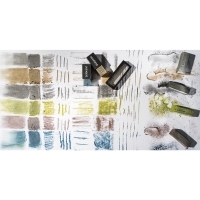 Set of 6 — This set contains one each of Olive Green, Dark Prussian, Raw Umber, Burnt Umber, Soft Black, and Very Soft Black.